Support: Monday-Friday. 8:00 a.m. - 6:00 p.m.
SAS JMP Pro is a statistical software that links statistics with graphics to explore, understand, and visualize data. It provides comprehensive statistical tools, design of experiments, and statistical quality control. SAS JMP Pro can work with a variety of data formats, such as text files, Excel files, SAS data, and ODBC-compliant databases. Faculty & Staff, Students, and University Depts: : The University has entered into a site license for SAS JMP Pro. SAS JMP Pro lets you use the data you have now to better anticipate the future and plan well for tomorrow. 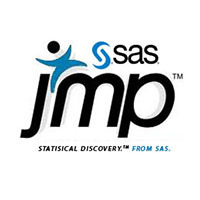 Built with scientists and engineers in mind, SAS JMP Pro statistical analysis software provides all the superior visual data access and manipulation, interactivity, comprehensive analyses and extensibility that are the hallmarks of JMP, plus a multitude of additional techniques. Utilize advanced analytics with SAS JMP Pro, like generalized regression, mixed-effects models, advanced consumer research analysis, reliability block diagrams, and more. SAS JMP Pro also features predictive modeling with cross-validation, model comparison and averaging features, exact tests and one-click bootstrapping.